We can identify objects by the way they feel. As we move our fingers over objects in our pocket or purse, we can easily distinguish between our keys and our phone or between two different fabrics in our dresser drawer. The tactile perception of the surface texture of objects, i.e., of their microstructure and material properties, contributes to our ability to identify them by touch. Signals in the nerve convey information that allows us to identify different textures, as well as attribute different perceptual properties (e.g., roughness or hardness) to them. 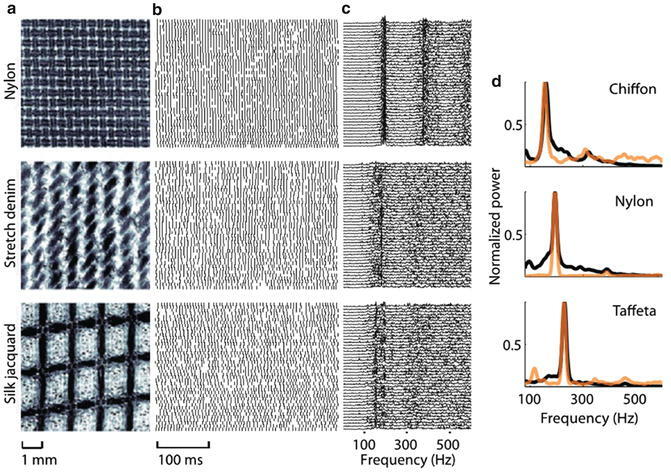 When we run our fingers across a textured surface, a characteristic pattern of deformations is produced in the skin (Sripati et al. 2006), and the resulting stresses and strains are transduced by multiple populations of mechanoreceptors embedded in the skin. The spatial layout and timing of the consequent spatiotemporal patterns of afferent activation convey information about surface texture (Weber et al. 2013). As coarse textural features indent the skin, their spatial layout is reflected in the spatial pattern of activation evoked across the population of Merkel disks, which are relatively dense in the fingertip skin and are innervated by slowly adapting type 1 (SA1) afferents (Johansson and Vallbo 1979) (Fig. 1). SA1 afferents thus encode spatial patterns in a manner analogous to photoreceptors in the retina. SA1 responses are uniquely suited to transduce spatial features as they have small receptive fields; that is, they only respond to small and sharply defined patches of skin. SA1 responses are strongly modulated by spatial features like edges, corners, and indentation depth (Johnson 2001). The spatial image carried by SA1 afferents is further elaborated in the somatosensory cortex, where neural responses exhibit a sensitivity to spatial features like edges (Bensmaia et al. 2008; Phillips et al. 1988), curvature (Yau et al. 2013), and motion (Pei et al. 2010) in ways that draw strong analogies to their visual cortical counterparts. Although the SA1 spatial image effectively relays information about coarse textural features, many tangible surface features are too fine to be resolved spatially, given that the skin filters out very fine features (Sripati et al. 2006; Weber et al. 2013). In fact, information about fine textural features is not perceptually accessible until the skin is actively scanned over a surface (Hollins and Risner 2000). Movement between a textured surface and the skin results in vibrations (Manfredi et al. 2014; Bensmaia and Hollins 2003, 2005) that reflect both spatially resolvable features as well as fine surface microgeometry. These vibrations elicit highly precise and repeatable temporal spiking patterns in rapidly adapting Meissner corpuscles (innervated by rapidly adapting or RA afferents) and Pacinian corpuscles (innervated by PC afferents). 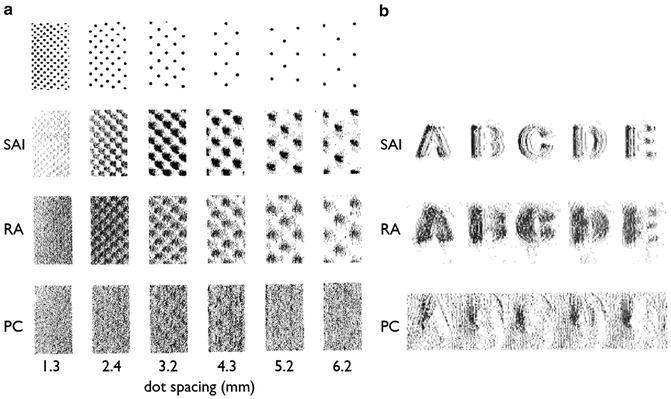 These patterns carry information about the skin vibrations (Talbot et al. 1968; Mackevicius et al. 2012) and thus about the texture itself (Weber et al. 2013; Fig. 2). In summary, then, coarse textural features are encoded in the spatial pattern of activity evoked in one population of afferents – SA1 fibers – while fine textural features are encoded in the temporal patterns of activity evoked in the other two, RA and PC fibers. The sensation of exploring a surface can be described along a number of perceptual dimensions: things may feel rough or smooth, hard or soft, sticky or slippery, and warm or cool (Hollins et al. 2000). The dominant dimension, and the most studied one, is roughness. Perceived roughness is determined by how variable the neural responses to textures are over time and space. Specifically, the spatial variability across the SA1 population response (Fig. 3a; Connor et al. 1990; Connor and Johnson 1992; Blake et al. 1997) is integrated with the temporal variability in the response of RA and PC afferents (Fig. 3b, c; Weber et al. 2013) to culminate in a percept of roughness (Fig. 3d). In other words, a texture is perceived as rough to the extent that different SA1 afferents produce different responses and individual RA and PC afferents produce responses that change over time. Signals from multiple receptors types are necessary to explain roughness. (a) SA1 spatial variation is plotted against judgments of roughness for natural textures, including both coarse (plastic dots and gratings, green) and fine (fabrics and sandpapers, orange) textures. Error bars represent SEMs across subjects (roughness) and neurons (variation). The gray line denotes the line of best fit. SA1 spatial variation barely changes across a fourfold scale in roughness for fine textures. (b and c) Temporal variation for RA and PC afferents, respectively, plotted against perceived roughness. (d) A combined model of all three predictors almost perfectly predicts texture roughness (Weber et al. 2013). Sensitivity to peripheral variability is a common feature of sensory processing. Indeed, when stimuli do not change in time, central sensory neurons across all modalities adapt toward their baseline level of activity (Wark et al. 2007). In this way, adaptation serves to increase neural sensitivity to variations in the sensory input. Furthermore, sensory neurons in both visual and somatosensory cortex exhibit both excitatory and inhibitory components and thus show sensitivity to spatial differences in activation across the sensory sheet. Judgments of surface hardness lie on a subjective continuum that closely covaries with measurements of surface compliance (Fig. 4a; Harper and Stevens 1964). Information from spatial patterns of afferent activation, response timing, kinesthesia, and even audition may be combined to culminate in a percept of hardness (Srinivasan and Lamotte 1995; LaMotte 2000). Thus, hardness perception involves a complex reconstruction of a measureable surface property but does not seem to be based on a simple readout of a singular neural quantity. Information from both spatial and temporal mechanisms is combined to reconstruct judgments of hardness. Surfaces with different compliance lead to different spatial patterns of deformation of the skin: soft surfaces deform around the skin, while hard surfaces change the shape of the skin. These spatial patterns of skin deformations are reflected in the spatial patterns of activation elicited in populations of SA1 afferents (Franzén et al. 1996). Precisely timed information can also be used to determine hardness. When judged through a probe, hardness is most effectively perceived using rapid tapping motions (LaMotte 2000), which elicit dynamic force profiles that most effectively recruit RA and PC afferents. Indeed, while SA1 responses to statically indented stimuli are informative about surface compliance, RA responses only convey hardness information during the dynamic loading phase (Fig. 4b; Condon et al. 2013). Perceptual judgments of stickiness are often closely correlated with perceptual judgments of roughness (Hollins et al. 2000). When exploring the stickiness of a surface, subjects tend to apply a set amount of force normal to the surface. The resulting range of force tangential to the surface covaries closely with measurements of perceived stickiness (Smith and Scott 1996). Tangential forces stretch the skin, which excites Ruffini cylinders (innervated by slowly adapting type II (SAII) afferents) (Knibestol 1975) as well as SA1 and RA afferents (Birznieks et al. 2001, 2010). Perception of a surface’s temperature is clearly used for object identification (Katz and Krueger 1989) and is incorporated into the multidimensional percept of texture (Bensmaia and Hollins 2005; Hollins et al. 2000). Because everyday objects tend to be colder than skin temperature, surface temperature is determined by the rate of heat flow out of the skin (Ho and Jones 2006). This heat flow is almost certainly transduced by thermoreceptive afferents in the skin (Darian-Smith et al. 1973, 1979; Johnson et al. 1973, 1979). Spatiotemporal patterns of activation across the four main populations of afferents that innervate the glabrous skin of the hand – SA1, RA, PC, and SAII – as well as thermoreceptors, convey exquisite and multidimensional information about surface texture. Different information about surface texture is conveyed in different aspects of afferent responses, with spatial patterns mediating the perception of coarse features and compliance and temporal patterns mediating the perception of fine features. Importantly, the perception of texture reflects the integration of different types of signals from multiple different tactile submodalities.